After vociferous opposition from Starbucks, Amazon, and other large Seattle-based corporations last summer, the Seattle City Council voted to roll back a tax that would have raised $47 million towards building 591 units of affordable housing. Now, Microsoft has announced that it will invest $500 million for affordable housing over the next three years across King County, Washington. Seattle has been plagued by rising rents and homelessness rates as the area has grappled with a housing shortage, caused in part by inflated demand and stagnant wages. Amazon and other so-called “mega-corporations” in the city had successfully talked the government down from imposing a $500-per-employee head tax that would have funded 1,700 new units of affordable housing in May of 2018 before the watered down version of the tax was ultimately killed in June. Affordable housing and homelessness advocates, who felt that the large companies headquartered in Seattle are partially responsible for its tight housing market, saw the move as adding insult to injury. Microsoft, which is headquartered in neighboring Redmond, wouldn’t have been hit with the head tax, but the initiative sparked a dialogue between Microsoft and the business-led group Challenge Seattle. The plan, which is still being finalized, sprung out of their conversations last summer on how to close the gap in affordability in housing across the region. The $500 million will be doled out as a series of grants that Microsoft is calling “targeted investments," across three stratified tiers. 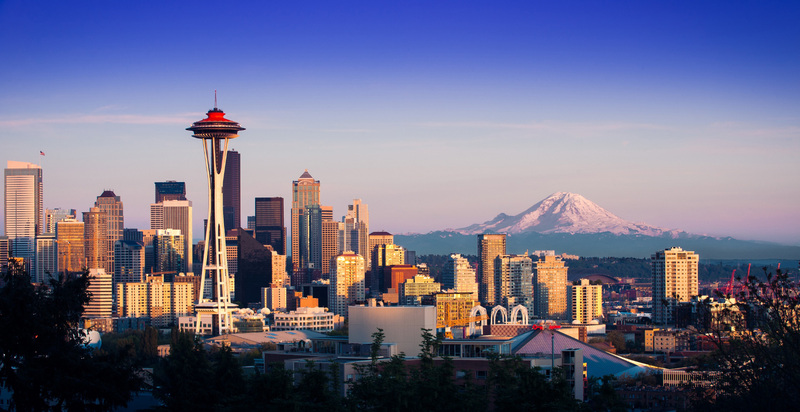 The company will load $225 million at a lower-than-market rate to spur the construction of middle-income housing across six cities to the east of Seattle: Bellevue, Kirkland, Redmond, Issaquah, Renton, and Sammamish. Microsoft will be lending an additional $250 million at market rate to support the construction of low-income housing across King County. The remaining $25 million will be distributed as grants to combat homelessness in and around Seattle. As part of its announcement, Microsoft revealed that $5 million of its grant will be going towards Home Base, a program that provides legal aid to families facing eviction, and another $5 million will be used to support a new joint agency being formed between Seattle and King County to tackle homelessness. Rather than using that money to solely build housing, which Microsoft expects would only generate about 1,000 new affordable units, the tech company claims that its targeted investments have the potential to spark development of “tens of thousands” of new units. While the company doesn’t expect to make much of a return, it plans to repeat the process and reinvest the money after being repaid. While this is Microsoft’s largest philanthropic gift to date, the company’s motives likely aren’t entirely altruistic. As the New York Times noted, the company is currently riding high with nearly $136 billion in cash on hand and is in the process of renovating its 500-acre Redmond campus. Supporting the region’s housing stock is a boon to lower-income residents, but will also provide a long-term solution for potential employees the company continues to woo as it expands. 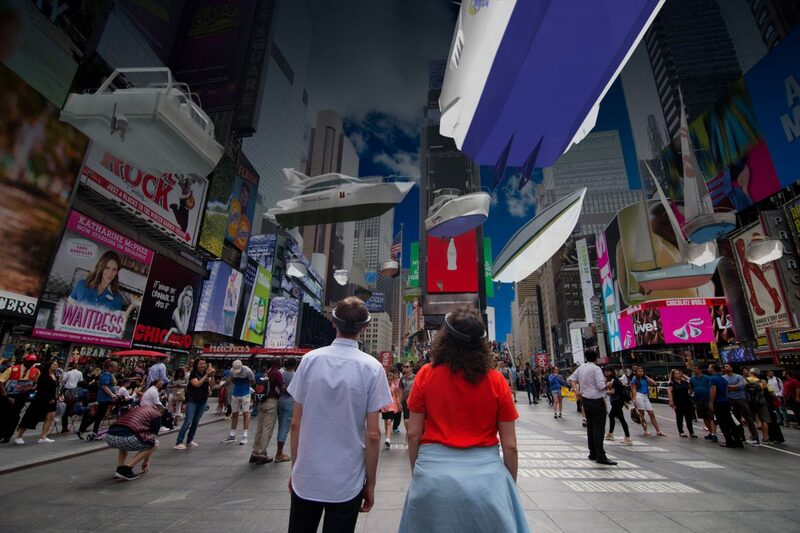 This summer, visitors to Times Square can take in an underwater virtual reality experience, courtesy of the North Carolina-based conceptual artist Mel Chin and technology giant Microsoft. The site-specific mixed-reality public art installation titled Unmoored will come to life from July 11 through September 5. Chin tackles the topic of climate change, imagining a future where melting ice caps cause the city to go underwater. As visitors look through VR goggles, they can see a 'nautical traffic jam' of 3-D modeled ships, each with their own unique identification number and name. Ships move slowly in the city, bumping into each other and buildings, creating waves rendered by realistic animation and sound effects. Visitors can also view Wake, another public artwork by Chin, which “evokes the hull of a shipwreck crossed with the skeletal remains of marine mammals,” beside a sculpture of the 19th century opera singer Jenny Lind. Chin chose New York City as the site for the word because it represents the center of trade, entertainment, and capitalism for the country. Its history is loaded with topics that resonate today, like guns and slavery. The USS Nightingale, which was historically involved with the shipping of slaves, is digitally recreated in the Unmoored experience. The installations are part of an exhibition titled Mel Chin: All Over the Place, presented with the Queens Museum of Art and NYC-based, nonprofit arts organization No Longer Empty in various sites around New York. Times Square visitors can view the show through mobile devices via Unmoored’s mobile app, which is now available for download and use. Check this link for more details. Computer software giant Microsoft is moving along in its efforts to replace and expand its longtime corporate headquarters campus in Redmond, Washington, east of Seattle. 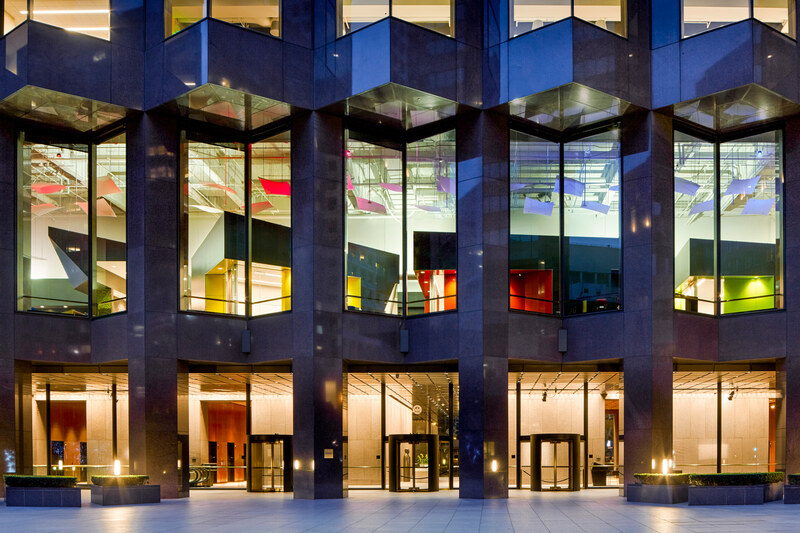 According to Geekwire, Microsoft recently announced the architecture and contracting teams for the transformational project, which aims to replace nine existing two-story office clusters with 18 four- and five-story office blocks. On the design side, LMN, NBBJ, WRNS Studio, and ZGF Architects are on board for the 3 million-square-foot project; Berger Partnership will act as lead landscape architect with OLIN partnering on the project as well. 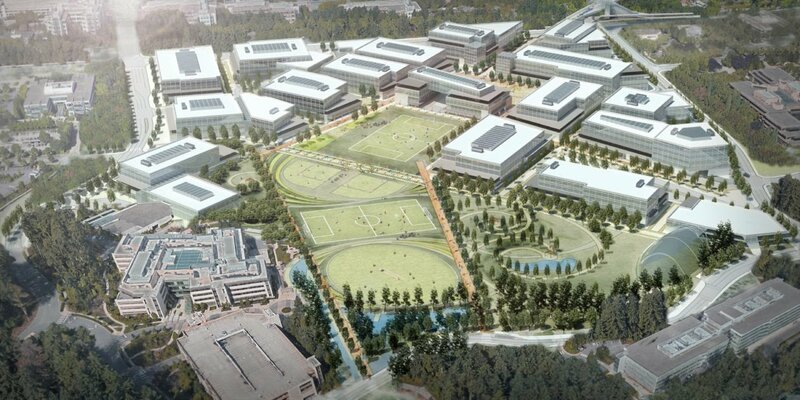 Microsoft has also selected Skanska, Balfour Beatty, GLY, and Sellen as general contractors for the re-do, which will affect roughly 72 acres on Microsoft’s 500-acre campus. The project will demolish all of the of the site’s original 'X-Wing'-style, 1980s-era office buildings, replacing those facilities and then adding a net 1.8 million-square-feet of space on top of what is existing. The new offices will be clustered into “distinct villages,” according to a Microsoft statement, with the core section aiming to be “more open and less formal” than the current campus. 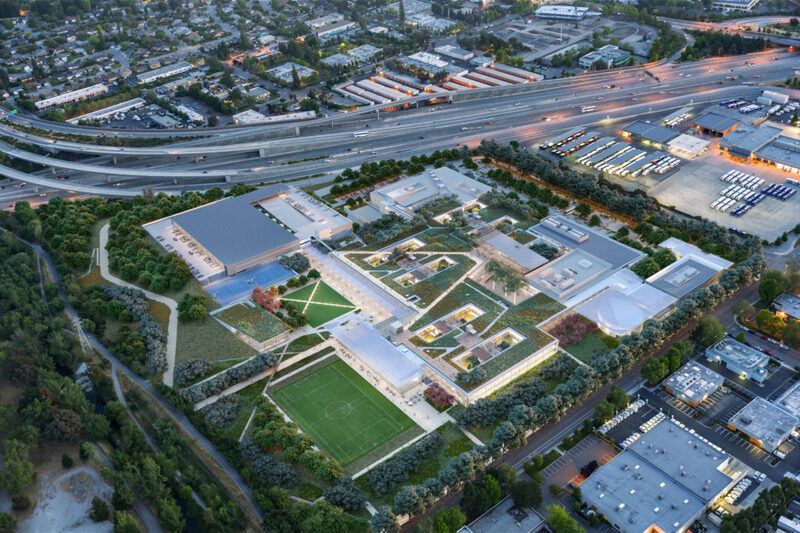 A rendering unveiled by Microsoft depicts glass-wrapped office buildings laid out along a skewed grid surrounding a central green containing playing fields and a bosque. The project comes as Redmond begins to densify ahead of forthcoming transit investments that will link the city with Seattle in coming years. The first phase of the city’s Overlake Village—a 170-acre mixed-use district that will eventually house 40,000 residents—is underway and will bring 1.2 million square feet of offices, 1,400 housing units, 25,000 square feet of retail uses, a hotel, and a conference center to the town. Microsoft aims to begin work on its $250 million campus expansion later this year with an eye toward completing the project by 2022. Microsoft has gone big and broken ground on its new Silicon Valley headquarters, with a sustainability-minded plan to modernize its Mountain View, California outpost. The 32-acre campus might seem small when compared to the company’s sprawling, 500-acre flagship location in Redmond, Washington, but Microsoft’s pursuit of a net zero non-potable water certification under the Living Building Challenge will make them the first tech company to totally reuse non-potable water. 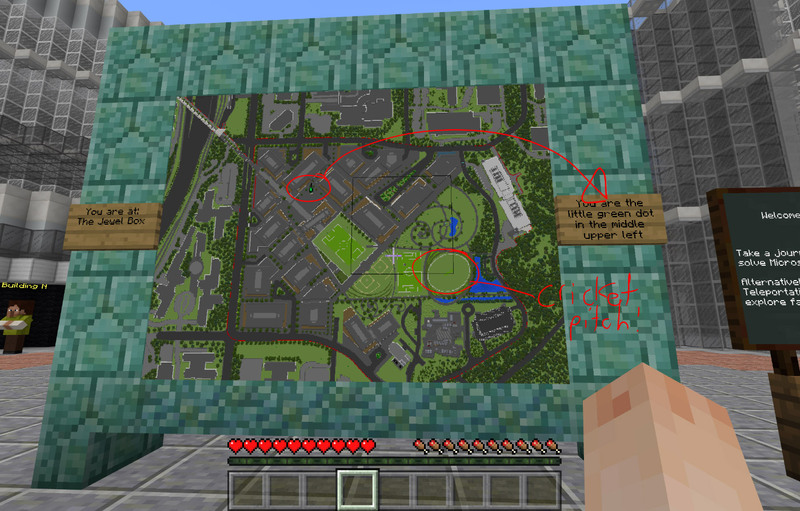 The redevelopment plans come as WRNS Studio replaced SOM early last year as Microsoft’s designers of choice. The redevelopment is leaning hard on a green modernization, with Microsoft pursuing LEED Platinum certification for all of its new buildings, committing to the WELL Building standards for the interiors, and integrating cross-laminated timber (CLT) throughout all of the new buildings to cut material usage. In trying to meet their water-use reduction goals, and acknowledging California’s limited groundwater availability, the campus will feature rainwater catchments and an on-site wastewater treatment plant so that drinkable water can be recycled for other uses. 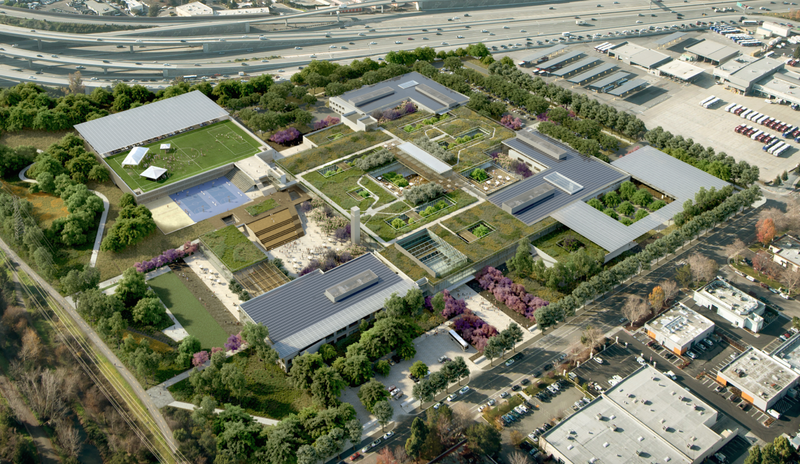 Because the campus is next to Stevens Creek, the tech giant is also introducing a 4-acre, occupiable green roof solely planted with native species. Rooftop solar panels will also help cut the campus’s energy usage, while the buildings will let natural light in through their uniformly large windows. Not to be outdone by the main, Seattle-adjacent campus, the project will also include an underground parking garage topped by a soccer field and a new athletics facility, while returning the former parking lots to nature. Besides modernizing the office space of their 2,000 San Francisco Bay Area-employees, the new campus will feature a renovated dining hall, new theater, conference center, and a “Microsoft Technology Center.” Microsoft has provided a full fly-through video of their plans below. The new Mountain View campus plan increases the existing 515,000-square-foot campus to 643,000 square feet, and comes amidst the recent opening of Apple’s new space-aged campus nearby. Similarly, Microsoft's renovation of its main headquarters in Redmond, announced at the same time as its Silicon Valley campus, feels like a direct response to Amazon’s city-hopping HQ2 plans. Microsoft's Silicon Valley campus is on track to re-open sometime in 2019. The new holographic headset by Microsoft, HoloLens, has just started shipping to U.S. and Canadian developers last week for $3,000 (the consumer version release date is still unannounced). Now we hear the tech company giant is partnering with global real estate developer Skanska to create the first leasing center in the world using holographic technology. No word yet on the leasing center’s location, but the space is expected to open this June. The center is slated to help sell Skanska’s proposed and unbuilt project, 2+U, a downtown Seattle high rise planned between First and Second Avenues and Seneca and University Streets, with expected completion early 2019. 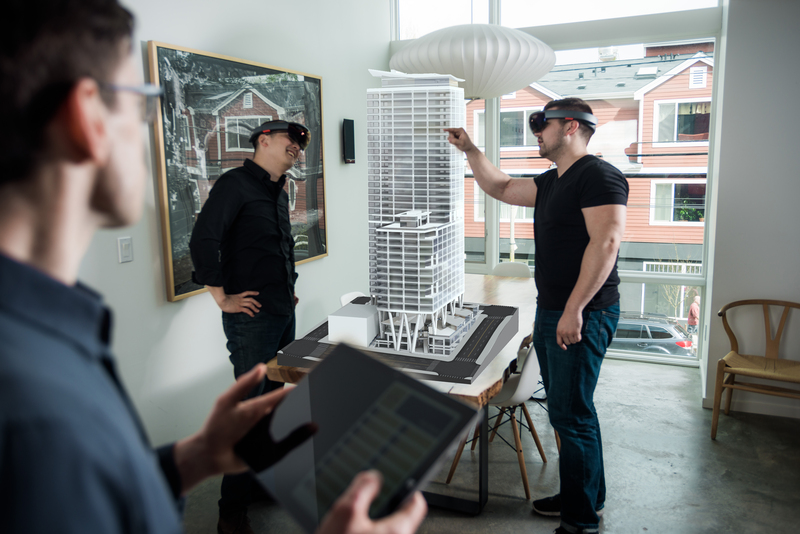 Seattle-based digital production agency Studio 216, which specializes in real estate virtual and mixed-reality visualizations, is partnering with Microsoft and Skanska on the 2+U project. Unlike other virtual reality headsets such as Oculus Rift (which Facebook's acquired for $2 billion), HoloLens is untethered, and incorporates a more “mixed reality” or an “artificial reality” setup: users can still be present and aware of the space they are in and other people around them. Holograms are “projected” onto real objects in space. “Developing for Hololens is similar to developing for VR headsets, but you have to ask yourself different questions,” said Kyle Riesenbeck, Technical Lead for the 2+U Holographic project in a press release. “With VR, you have to create both the environment and the content, but with Hololens, the challenge is determining the best way to have your content interact with your existing world, and enhance your real life experience in a unique and necessary way.” According to Microsoft’s website, the device features sensors, a processing unit, special high-def color lenses, and built-in speakers. Microsoft is also collaborating with Lowe’s, the home improvement company, to help customers visualize new kitchen or living layouts, finishes, and more. Since we are on the topic of holograms, enjoy this YouTube video of the Seattle skyline, featuring a different type of holographic technology.